Tonight's Quadrantid meteor shower is not only the first of 2012, it also has the potential to be one of the most spectacular cosmic light shows of the year — so long as you're prepared. Here's what you need to know to catch as many shooting stars as possible. The first thing you should know is that Quadrantid meteors are notoriously unpredictable when it comes to their intensity, and that the window of peak meteor activity for the Quadrantids is much smaller than most; while meteor rates for many showers (like the Perseids, in August) increase over the course of a couple days, the Quadrantid shower only does so for around six hours. 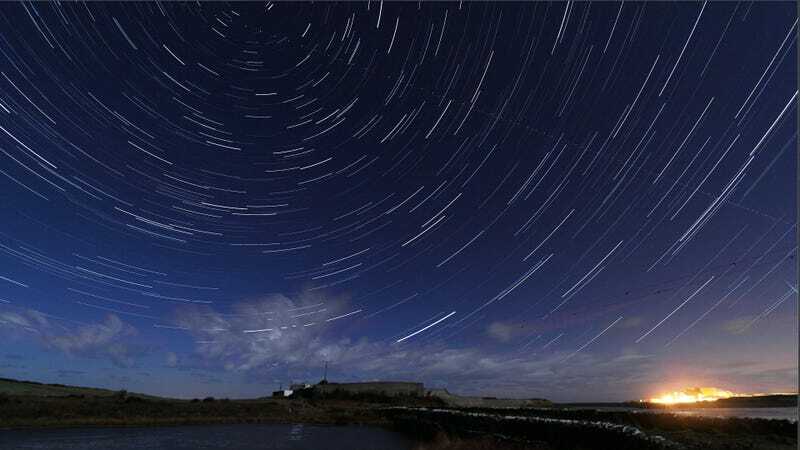 The good news, however, is that astronomers expect tonight's display to deliver in a big way — according to NASA, stargazers could spy as many as 60—200 meteors per hour at the shower's peak. Said peak should occur in the wee hours of January 4th, starting around 2:30 am EST. The display is expected to favor eastern North America, where the Moon will set around 3:00 am. This will leave a few of hours of darkness for optimal meteor-viewing. Don't live on the East Coast? Don't despair. NASA says that people living in green areas on this visibility map should catch a decent shower, provided they are "in dark sky conditions." Live in the yellow or red regions of the map? You'll have a much harder time spotting the meteors, but don't let that keep you from watching a live broadcast via NASA's sky cam in Huntsville, Alabama. You'll want to seek high elevations and shun city lights, pack plenty of warm clothing, and bring a comfortable lounge or blanket that will allow you to watch as much of the night sky as possible without craning your neck. You can bring a telescope if you'd like, but you really shouldn't need one. The shower's radiant (the region of the sky from which meteors will appear to originate) is near the end of the handle of the Big Dipper, but your best bet is to probably just look straight up, or to face away from the Moon (if it's up), keeping in mind that meteors can appear anywhere in the sky. For more tips on what to bring on a stargazing outing and how to avoid light pollution, see our how-to guide for last year's Perseids — a different shower, obviously, but the pointers still apply. Want to join local experts in observing the shower? Look up your neighborhood astronomy club. Wondering when the ideal time to watch is for your specific geographic location? Check out NASA's Fluxtimator (you'll want to change the first field to "10 Quadrantids," select the location nearest you, and change the date to January 3—4, 2011 2012). Cloudy skies ruining your stargazing/live in the Southern Hemisphere? Watch the shower live via NASA's sky cam in Huntsville, Alabama.